Dedunu Dissanayake is a writer who firmly believes in a world where love reigns supreme,manifesting itself in different flavors, and that love should never be analyzed or categorized. Having explored different vistas as a journalist, a features editor, a university lecturer in English literature, a secretary and travel assistant, she has finally answered her heart’s calling and dedicated her life to what she loves most—writing. She lives in the hills of Sri Lanka and believes that next to people and travel, books are the most important and wonderful things in the world. 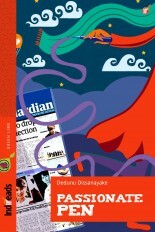 Dedunu has two published collections of love stories.